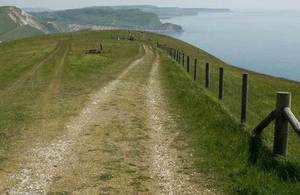 Progress on England's Coast Path with more miles set to open in the spring. Work is now underway to open up half of England’s coastline as part of wider government plans to complete a path around the whole of the English coast. The announcement by Rural Minister Rory Stewart marks the latest milestone in the delivery of one of the world’s longest walkways. The England Coast Path will stretch out across 2700 miles of stunning walking routes covering 100% of the country. Already families can explore 101 miles of our spectacular coastline via the England Coast Path in Cumbria, Durham, Dorset and Norfolk, with a further 95 miles of new routes set to open in Kent and Somerset in the spring. We are working closely with Natural England to build on the progress already made, with the aim of completing the coastal path around England by 2020. Walking in the countryside is good for people’s health and wellbeing, and providing more access to our coastline brings huge benefits by both connecting us with nature and boosting local tourism. Tourism is hugely important to the rural economy, contributing around £11 billion each year – and by attracting even more visitors to explore our iconic coastline, we expect the England Coast Path to benefit even more local businesses like pubs and hotels. As an historic seafaring nation, a deep connection with our coastline is an integral part of our national identity. None of us lives further than about 75 miles from the sea, and most of us live much closer, so it’s vital to our ongoing relationship with our countryside that the public has easy access to our outstanding coastline. We have already opened up miles of our beautiful coastline for everyone to enjoy, boosting local tourism and growing the rural economy, so it makes sense to extend these plans even further. We know that walking in the countryside is good for people’s health and wellbeing, and what better way to do it than with the accompaniment of a nice sea breeze? This is the most significant footpath project for a generation, it will be an incredible legacy for our island nation and I’m delighted to report on our excellent progress this year. Visitors from home and abroad enjoy our spectacular coastlines and love to walk our National Trails, which pass through some of our most stunning countryside. We know from our evidence of spending by visitors to the coast, that the route will boost the local economy and help support coastal communities. We are on target and have built a momentum to complete the entire route by 2020. Work to open up or improve access along our coast is also underway around the country with work recently started in Essex, Devon, Hampshire, Lincolnshire and Lancashire, and Natural England, which is coordinating the development of these routes, will be continually opening up new paths over the next five years. The new routes will also improve public access to our coastline, beaches and foreshore, with existing coastal footpaths used where possible, or in some cases moved nearer the sea so walkers have a better opportunity to properly enjoy our coastal views and beaches. The England Coast Path will be a well way-marked National Trail around the whole of the English coast, passing through some of our country’s finest and iconic landscapes such as the White Cliffs of Dover, St Bees Head, and the sunny beaches of the South West, together with picture postcard villages and the cities that plot our colourful maritime history. You can read further information and updates on Natural England’s progress in completing the England Coast Path. To establish the route the coast of England has been divided into 66 ‘stretches’ with eight Natural England delivery teams working around the country. The teams work closely with local authorities, land owners and occupiers, communities, interest groups and others to ensure the best and most appropriate alignment for the new coast path. For the first time, the legislation under which the route is created also enables Natural England to identify where the route will naturally roll back if it is eroded away by the sea, safeguarding the pathway for the future. For more information please contact the Defra press office on 0207 238 6751 or Natural England Press Office on 0300 060 1155 or out of hours on 0300 060 0101.